In Gainesville, FL, air conditioning is no laughing matter. Hot, humid summers necessitate an escape into the cool comfort of your home, making a proper air conditioning system far more of a necessity than a luxury. But you may find that your air conditioning cools your house unevenly, or cools parts of the house that you rarely spend extended periods of time in. In that case, you may want to integrate a zone control system into your air conditioning system, which provides better control over the air flow in your house and could save you money on your electric bills. A zone control system basically divides your home into separate zones, then establishes controls allowing you to alter the temperature in each zone. So if one family member can set the temperature to 68 degrees in the living room, while another can sleep in the bedroom with the temperature at 72. Zone control systems do this through a variety of methods, including dampers in your existing duct system that control the air flow to different parts of the house. There are numerous reasons for doing so. The biggest is probably energy savings. By cooling only specific parts of the house, your air conditioning doesn’t have to work as hard, and thus spends less energy to perform its job. In addition, zone control allows you to maintain an even temperature throughout your house more readily. An upper story, for example, tends to be warmer than a lower story, since hot air rises. Zone control lets you maintain the same temperature much more easily, so that no single story is warmer or cooler than any other. If you want to integrate zone control into your air conditioning system, it pays to consult an expert on the best way of going about it. In Gainesville, FL, Touchstone Heating & Air has the expertise to both advise you on your options and to install a zone control system in your house. Contact us today to set up an appointment, and let us show you what a difference our experience and professionalism can make. Air Conditioning Repair in Jacksonville, FL: Why is My AC Blowing Warm Air? When you turn on your air conditioning system, you expect it to start producing cool air immediately. But if it is pumping warm air into your home, it likely means that you need to call for air conditioning repair in Jacksonville, FL. Here at Touchstone Heating & Air, we’ve responded to countless calls for service and we often get asked why our customers’ AC system is blowing warm air. Here is a quick explanation of what might be causing this problem and why you should call for repairs immediately. Low refrigerant – Your air conditioning system uses a compressed refrigerant to remove heat from your home and exhaust it outside. If there isn’t enough refrigerant in the system, then your AC won’t be able to remove the heat from your home’s air and it will just get circulated back into your home. Broken compressor – Your air conditioning system uses a compressor to compress the refrigerant that it then uses to remove heat from your home’s air. If the compressor is broken, it won’t be able to compress the refrigerant, which means that your AC won’t be able to provide you with any cooling. Instead, the fan will just circulate the warm air from your home back through your ducts and into your house. Thermostat issues – An often overlooked component of your air conditioning system is the thermostat. Your thermostats detect the temperature in your home and then activate your AC based on the temperature that they read. If the thermostats aren’t working ell they could be telling your AC that your house is cool enough and to just run the fan. This would cause your air conditioner to just circulate hot air through your home. No matter what kind of air conditioning repair in Jacksonville, FL you need, just call Touchstone Heating & Air immediately. Your air conditioning system won’t automatically fix the issues that its having and they will likely only get worse. Calling for professional repair early is a great way to nip the problem in the bud before it causes further issues with your home’s AC system. Posted in Air Conditioning | Comments Off on Air Conditioning Repair in Jacksonville, FL: Why is My AC Blowing Warm Air? Air Conditioning units are complex machines and require regular tuning and maintenance in order to operate at full capacity and efficiency throughout the summer. One common issue we find is a clogged drain line, in the video below we explain how to unclog that drain line using a simple wet vac. The easiest way to identify this issue is through a leaky unit or a noticeable drop in efficiency. The first step to unclogging or cleaning the drain line is identifying the valve. Once you have done so you can simply turn on the wet vac and connect it to the drain line, this will pull any items clogging the drain out and help promote a free flowing drain line. While this may seem like an easy fix please use caution when completing this task, as a best practice we highly recommend calling us here at Touchstone Heating & Air whether you are in Lake City, FL or any of the surrounding areas. If you decide to take on this task on your own please keep in mind that you are doing so at your own risk and Touchstone Heating & Air will not be held liable. In Gainesville, FL, air conditioning is far more necessity than luxury, and local residents are used to higher energy bills when the mercury starts to rise. Luckily, it doesn’t have to be that way. Saving energy can be easy, and you can begin at the thermostat: the one part of the air conditioning system that almost everyone is familiar with. You can start with a fairly easy step: set your thermostat to a slightly higher temperature than you’re used to. 78 degrees doesn’t feel much different than 73 degrees, but it can save a fair amount of money with your monthly bills. You might also consider replacing an old manual thermostat with a programmable one that automatically turns the AC off when you leave for work and turns back on just before you get home. That provides a cool home when you arrive without wasting countless hours of energy keeping it cold when you’re not around. On a more technical level, a thermostat’s placement in the house can affect its accuracy. Thermostats use air currents passing through them to determine the temperature in a given room. A thermostat placed in a breezy corner or unusually sunny spot may misread the temperature, causing the AC to turn on when it isn’t needed. Moving the thermostat to a spot that more accurately reflects the temperature of the room can help you save money on unnecessary costs. 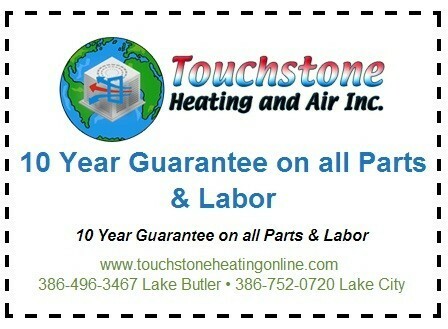 For 15 years, the dedicated professionals at Touchstone Heating and Air have worked to save you money by keeping your air conditioning in peak shape. We can help you move your thermostat and/or replace an outdated model with something newer and easier to use. Either way, it will help you with saving money at the thermostat, and as always, you can trust us to do the job right the first time, every time. Contact our Gainesville, FL air conditioning technicians today and see how we can save you money at the thermostat. My Air Filter is Wet: Do I Need Air Conditioning Repair in Gainesville, FL? Your air conditioning system has an air filter in it that is there to protect the moving parts from dust and debris. 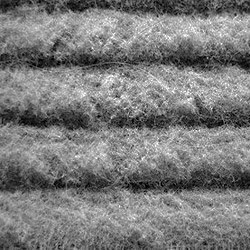 If this air filter isn’t properly maintained it can cause a whole host of issues for your home. A common problem that we get called to repair is a wet air filter. Make sure that you call for professional air conditioning repair in Gainesville, FL whenever you have any issue with your system. Here at Touchstone Heating & Air, we wanted to put together a quick explanation about what could be causing the problem of a wet air filter. In order to cool the air in your home, your AC system passes the warm, moist air from your home over a series of evaporator coils. Similar to the way condensation forms on the outside of your glass on a hot day, condensation will also form on these evaporator coils. Normally, this condensation will drip down into a collector pan and rain away. However, if the condensation pan or the drain lines get clogged then water can leak out and cause many problems for your home. One of the things that can happen is for the water to leak out and get absorbed by the air filter in your system. Not only can this cause mold in the air filter, but it will also likely restrict the flow of air through your system. But this is just one possible explanation of what might be happening. It could also be that your AC system was installed poorly and the condensation from the evaporator coils somehow gets onto the air filter. It might also be that the air filter is installed in the wrong place. Either way, call for professional air conditioning repair in Gainesville, FL today. There are a couple of different ways for you to potentially avoid getting a wet air filter in your AC system. Get regular maintenance – One of the best ways to avoid air conditioning repair in general is to get your system regularly inspected and maintained by a pro. During regular maintenance visits, your AC technicians will look for any small issues that could be developing. They will fix these things before they cause further damage to your system and to your home. Get professional installation – Another great thing to have done if you’re getting a new air conditioner installed is to get it done by a professional. This will allow you to avoid many repairs that result from bad installation work. If you need air conditioning repair in Gainesville, FL, make sure that you call the friendly experts at Touchstone Heating & Air. Posted in Air Conditioning | Comments Off on My Air Filter is Wet: Do I Need Air Conditioning Repair in Gainesville, FL?